Here are a set of exercises that I often use at clinics which have proven themselves to be excellent for all sorts of ponies and horses. I most often use them for horses that are a bit agitated at the start of a clinic, are finding it hard to focus, for young horses or for riders that are feeling a bit nervous. In this situation we usually start in the walk and build to trot in exercises 4 and 5, as confidence builds. However, the exercises are great for schooling and suppling all horses. Putting some poles on the ground can make a schooling session far more interesting, focused and useful for you and your horse. If you ride the exercises well, paying attention to accuracy of your circles, transitions and your bend, your horse should start to relax, work more softly and in better balance. Horses that are young, old, just coming back into work or in rehabilitation from an injury would probably find 10m circles too small in trot and these are best done in the walk. Fitter and more experienced horses will benefit from working on these circles in trot. To ride them in canter would be a much more challenging exercise. The exercises rapidly lead to more focus for both horse and rider. By using poles it becomes much easier to ride accurate patterns. Through repetition of a pattern both horse and rider can relax much faster than when they work without clear markers or a definite plan. Place 4 poles in a star pattern as shown below. Placing the poles about 1m from the side of a 20m wide arena works perfectly, make the circle bigger than 20m if you have the space. 2 of the poles will be on the centre line. Most poles are about 10ft (3m) long and that allows space for the horse to work on a smaller circle inside the poles. 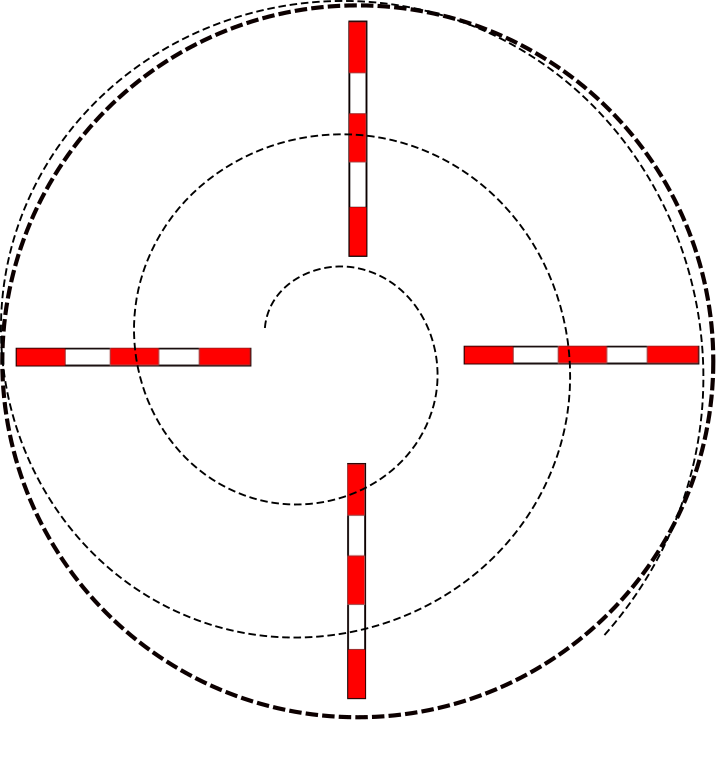 The outside circle is about 20m and the circle inside the poles is approximately 10m. Start off riding around the outside of the poles on a 20m circle. 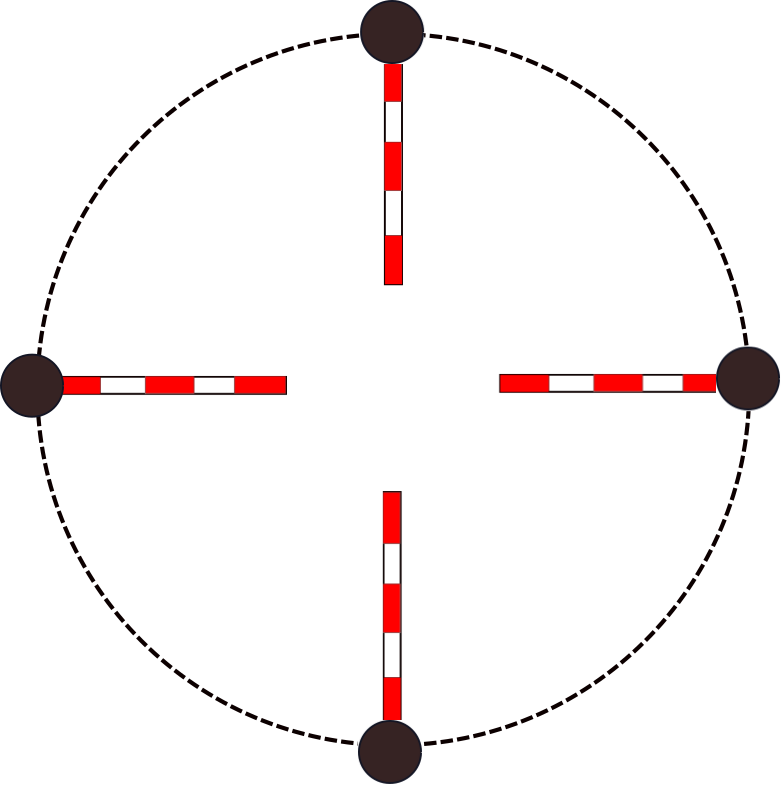 Each time you arrive at the end of a pole ride a smaller 10m circle, this should take you to the centre of the 20m circle, as show in the picture below. Its important to make the circle go all the way to the centre, if you just go around the pole the circle is going to be too small for most horses. Work on keeping the small circle just that, a circle. Its really easy to ride eggs, squashed and wonky circles so pay attention to the shape you are making. If its really hard to do this, take the time to notice which rein is causing you the most problems. Sometimes the location of the gate to the arena causes a magnetic-type pull that’s causing your circles to become ovals. 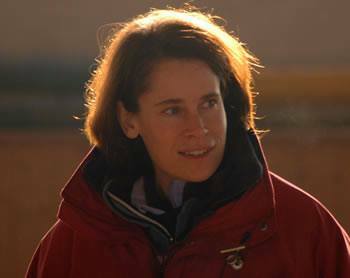 The other reason that you might struggle with the shape or size of your circles is because your horse finds it easier to work on one rein than the other and finds it difficult to distribute his weight evenly between his two shoulders (generally the problem originates from the hind quarters, but this subject is outside the scope of this blog). This causes him to take the wrong bend on one rein, to feel harder to turn in one direction than the other and to make the circle smaller going in one direction than the other. This “crookedness” is a big topic and is not covered in this post in any detail but its mentioned again in exercise 6 below as this is a great exercise for horses that prefer one rein to the other. This exercise is really similar to the one above except that now you are riding figures of 8 around the poles rather than circles. Start by riding around the outside of the poles on the 20m circle. Ride either the blue or the red figure of 8. When you return to the starting point, ride a ¼ circle on the original 20m circle and then ride the other figure of 8. Keep the shape of the figures of 8 round and even. 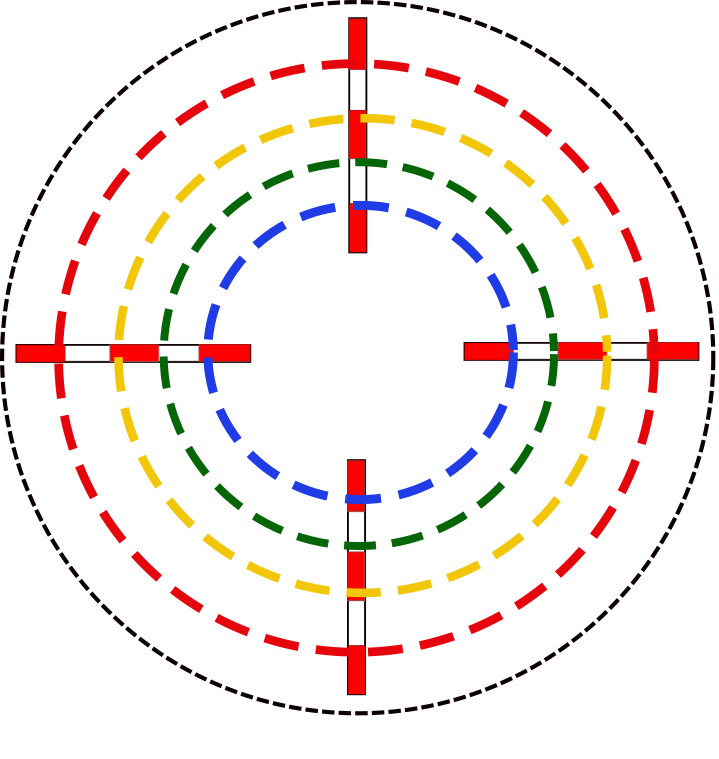 Check that you change direction in the centre of the 20m circle. You should not be riding over the poles in this exercise, they are just there for guidance. Ride in walk around the 20m circle, around the outside of the poles. 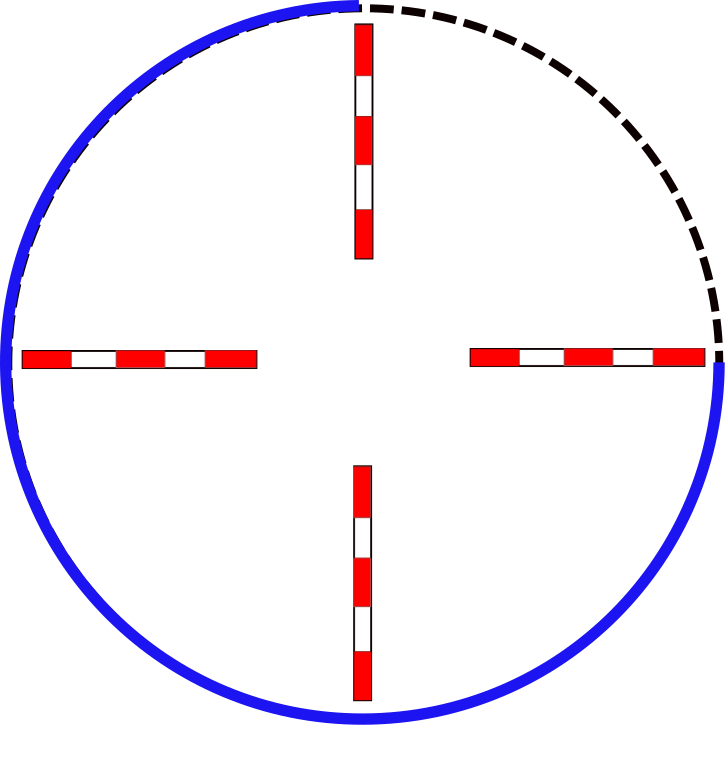 Make accurate transitions to halt level with each pole on the circle. On the picture, the black dots shows where you make your transitions. Check that your shoulder is level with the pole when you halt. The poles are useful in the exercise as you get feedback about how long it takes from the time that you start to ask your horse to halt until you are standing still. Its important that your horse consistently stops within the time or distance that you decide. Its your decision as to whether this happens within 1 stride or 5 strides but you need to help him understand the importance of stopping when you ask as this is one of the main ways in which you can help him to understand that you are the one who is making the decisions. 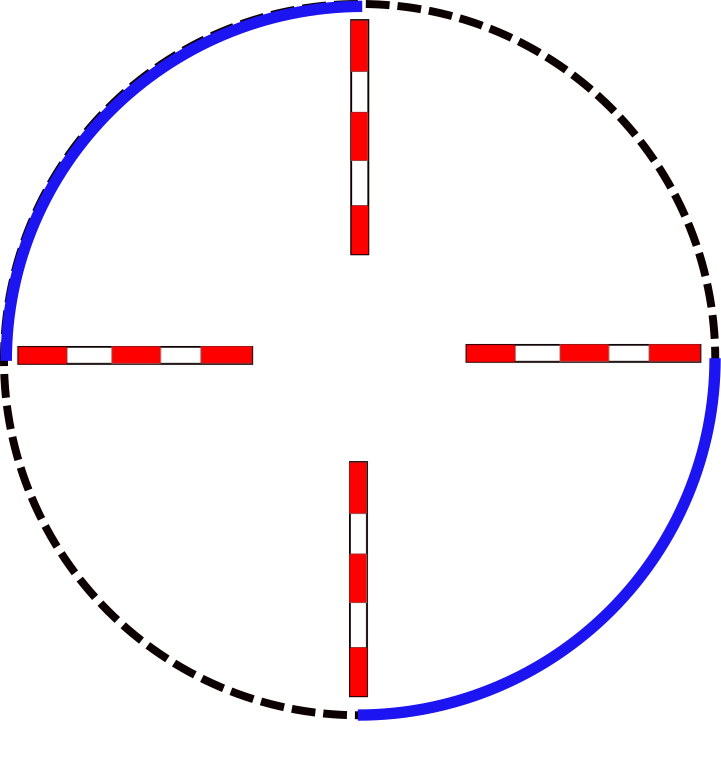 Ride ¼ of the circle in walk (the black dotted section of the circle), then ¼ in trot (the blue section), alternating each time you reach a pole. Make accurate transitions when your shoulder is level with the pole. As you repeat this exercise notice if its easier for you to make accurate upward or downward transitions. Its useful having the poles to measure how accurate you are and you can use them to adjust the timings of your cues to communicate with your horse sooner or later until you are accurate and consistent with both transitions. This is a great exercise to combine with exercise 4 above to build up longer periods of trot during the early work of a young horse. As above, be precise. Its so important that the rider is making the decisions about where these transitions are happening, not the horse. If your horse is rushing you could try adding in some smaller circles around the poles to slow things down (as with exercise 1 above). Your goal is that your horse responds quickly and smoothly to the cue for the upwards transitions and your downward transitions are soft (in that there is no or very little weight on the reins as you slow down) and accurate. This is an adaptation of a really useful and well known exercise. Start off in walk on the 20m circle outside the poles. Gradually spiral in until you are riding an 8 or 10m circle on the inside of the poles. Many show jump poles have 5 or 6 sections of different colours, you decrease the size of the circle just one section at a time, being really accurate about where your horse puts his feet. Then make the circle larger again, all the way to the 20m circle. When ridden well, you should be travelling out in a very slight leg yield, slowly and at the speed you decide with a slight inside bend. You will know when you get it right as the horse will soften in your reins, take the same bend as the circle and the movement should feel easy. If it feels difficult, tight or bracey then something is going wrong and get some help before continuing. Get the exercise working well in the walk before you go to trot. You may find it easier to use cones for markers rather than poles when you trot this exercise. You may notice that its harder to make the circle smaller on one rein. Also notice if there is one direction where it is harder to make the circle bigger. This may tell you which shoulder your horse likes to lean on, the horse will prefer to travel in the direction in which he is placing more weight. So, if he prefers to make the circle smaller when he is on the right rein and also prefers to make the circle bigger when he is on the left rein this may suggest that he likes to put weight on the right shoulder. He may be doing this due to a long-standing pattern of movement, he may be in discomfort due to his saddle or some other part of his body, you may be sitting crookedly or (and this is very common) you are not symmetrical in the way you use your reins with one hand heavier or active than the other. Because this exercise is difficult to ride well and there can be a number of causes of problems, its extremely useful to have some eyes on the ground from a coach to help you. Spiralling in and out of a circle is a really useful exercise to identify problems and can help the horse to become more symmetrical, balanced and supple in his movement. 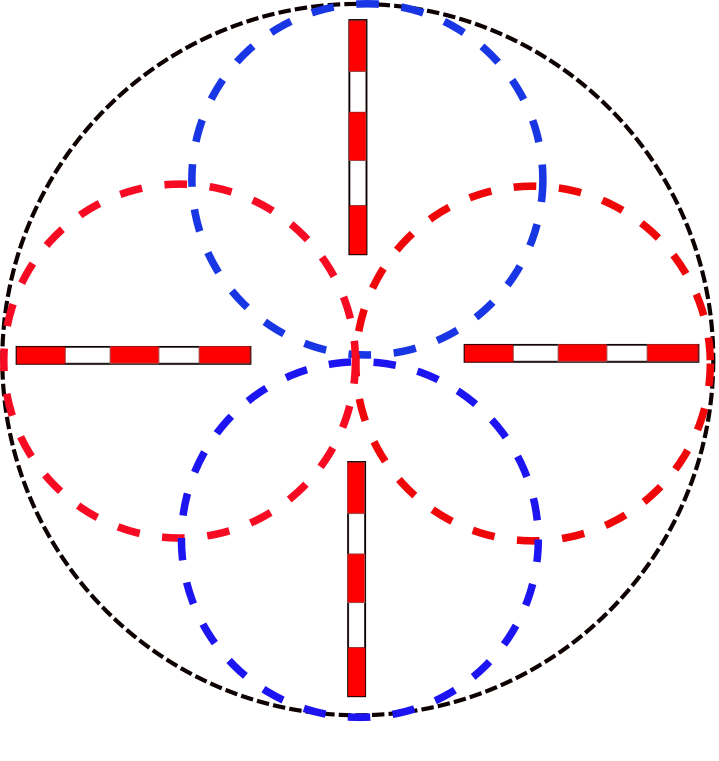 Walk or trot a circle over the poles as shown by the coloured dotted lines. If you have poles that have coloured stripes you can use this as a test of accuracy by choosing to ride a full circle over the end stripes or the middle stripes etc. Its much harder to ride accurately over either of the end of the poles than the middle as the horse will tend to avoid the pole. Be aware that as you ride a small circle in trot the poles might not be well placed for your horse and could cause him to trip or struggle with the distance, if this is the case just make the circle bigger. You could try this exercise in canter but stick to the outside of the poles or they will be too close together for the exercise to work well. Remember to look up and to breathe! When a horse if very anxious or a young horse is struggling in a new situation, it can help a great deal to desensitise them to one location and then gradually branch out and get them comfortable in a larger space. If you try to push too hard or to do too much too soon in this situation you can easily create more problems than you solve. The following exercise can help a lot in this sort of situation, but it does take some patience, don’t expect a quick fix if you want to get a horse really settled. If you are prepared to invest the time you will be rewarded with a calm horse and a long term solution. Work on the exercises above until you horse is happy on the 20m circle. What you have done through the repetition of these exercises is to create a “safe” zone for your horse where he will be feeling more comfortable. Try venturing out into another 15 – 20m circle immediately adjacent to the “safe” circle. As you move from one circle to the other change the rein. For example if you are riding the “safe” circle on the right rein, change to the left rein as you go onto the new circle. It can be extremely helpful to stay on a bend if you are riding a troubled horse because you have more ability to regain control on a bend than on a straight line. 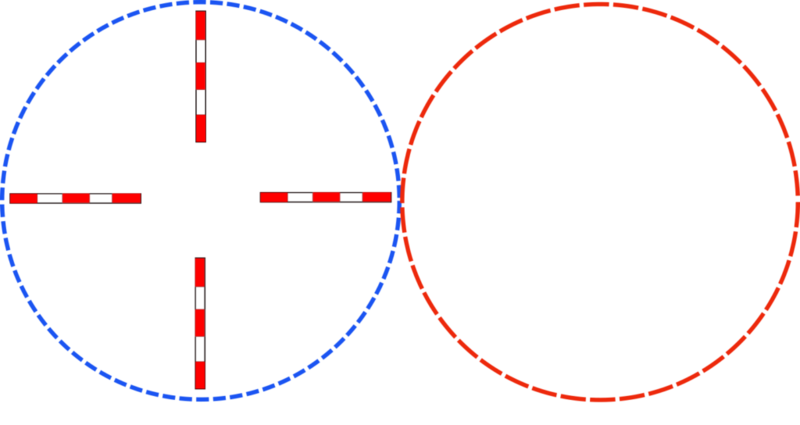 In this diagram the “safe” circle is the blue one and the new circle is the red. Ride the safe circle on one rein and change the rein as you branch out, effectively you are riding a figure of 8 which is an incredibly useful pattern for a horse that is worried and struggling to relax. This exercise could be applicable in an arena and be used with the pole exercises above or you could take the same idea and apply it when you are hacking, in a field, warm up arena or any other new or worrying location. I have adapted these exercises from an idea in Claire Lilley’s book “Schooling with Ground Poles” were she uses an exercise similar to 7 above as an exercise to improve rhythm in walk, trot and canter.